It's not like the parts are readily available. We’ve all had a fender bender or two and some of us have totaled a car, but few have experienced losing their coveted 1931 Ford Model A. Unfortunately, that’s exactly what happened to William Smith, only it was completely not his fault. 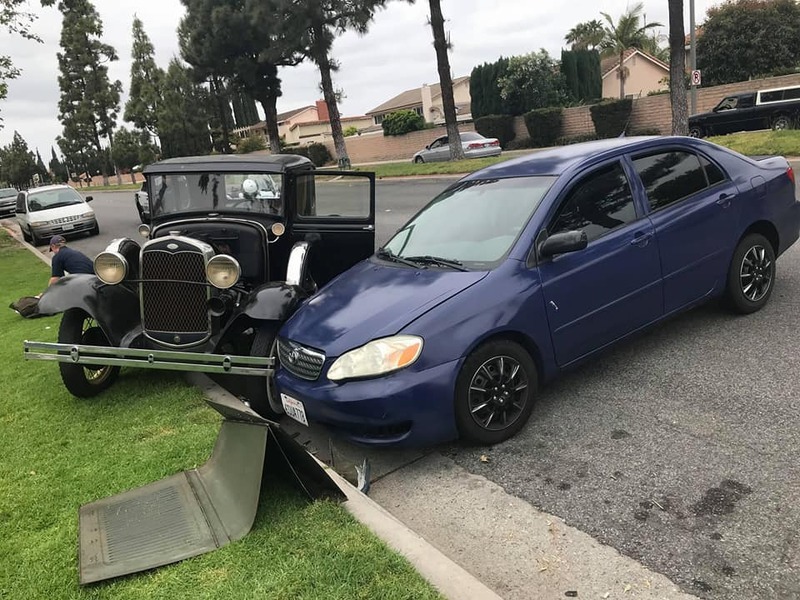 A woman driving a mid-2000s Toyota Corolla smashed into Smith’s Ford Model A while it was parked on the side of the street. Smith was not in the car, which is probably a good thing because not only was the body damaged, but the impact bent the frame, broke the driveshaft, split the engine block, destroyed the wire-spoke wheels, and launched the hood ten feet into the grass next to the car, according to The Drive. Smith talked to The Drive not long after he posted the incident to Facebook. “I think they call it a panic attack because I was crying and my hands were shaking uncontrollably,” Smith said. Apparently, Smith also had to keep the woman from fleeing the scene in her car. “She got back into her car and tried reversing, so I got behind it, but she wasn’t going to be able to get out anyway because her car was stuck in the spokes of my car’s wheel,” Smith continued. Instead of driving off, the woman took off on foot. Police soon found her and arrested her. It was then that she admitted to texting while driving. It also appears that she was speeding when the accident occurred and that she’d been drinking. Police arrested the woman on suspicion of hit and run and driving under the influence, according to Autoblog. Smith says that he and his dad will try to restore the car yet again. The Ford Model A was originally Smith’s father’s car. His father received the car as a 16th birthday present in 1973, and it has been in the family ever since then. In the early 1990s, the father and son duo tore the car down with the intent to restore it. It was only recently completed, and now it’s completely destroyed. You’d think that insurance would pay for the vehicle, but unfortunately, Smith had the vehicle underinsured, and the woman had bare-minimum insurance that will only pay him a small fraction of what it will cost to get the car back to its previous condition. The rear of the Ford Model A really took a beating, but the entire car is totaled. Almost every part of the Model A was damaged from the impact.